Do you ever notice the huge rock at the Ambulance site and wonder how and why it is there? Many years before we even knew time, a rock was located in a creek bank on a farm southwest of La Harpe. Over the years families grew and children played on the rock and in the creek waters. Eventually, the farm was sold. One of the children who had lived there had the rock moved to his place in Carthage where it remained until his death. His widow had a sale and the rock was bought by Bill Crabill at $400.00. He secured equipment to move the rock to La Harpe at quite some expense. 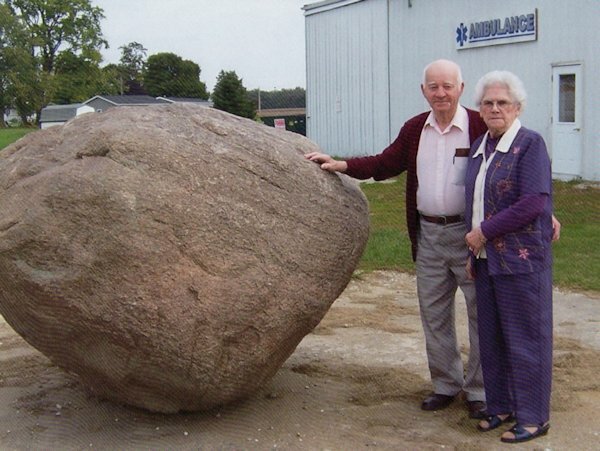 The rock was weighed and found to be 10,000 lbs (5 tons). It was situated on the ambulance property site. Bill gave it to the ambulance crew to memorialize all who serve the ambulance service over the years. Bill was a crew member for years and served this community whole heartedly in many ways. So the rock stands for an ambulance service here in La Harpe of which Bill was very proud. But the true "Rock"on which he built his faith and trust was Jesus Christ "the Rock of Ages". Now you know the "rest of the story." Lillian Crabill stands by her husband, the late Bill Crabill near the rock her husband had put much work, money, and time into, to honor his fellow ambulance crew members.